On our way to the "3rd Annual Spring Fling on Mackinac Island" we stopped by the Tawas Point Lighthouse for a few quick photos and a nearby Earthcache. For this one I lay on my back, the camera up-side-down, while the last remaining member of my party (the other three hit the trail to the tip of the point) laughed at me. I managed to hurt my noise pressing the camera into it while working this shot. It was worth it though as I think this image anchors the set very well. 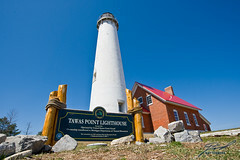 More good information about the Tawas Point Lighthouse.